The February, 2011 issue of Missouri Life magazine named Joplin as the number one city in the state. The magazine looked at a variety of criteria including education, crime, unemployment, public libraries, hospitals, and local sales tax. While the article is not available for free online, it does credit Joplin City Manager Mark Rohr for the inspired revitalization of downtown Joplin that has brought new life to the city. If you want to read more, just visit your local public library and see if it has the latest issue of Missouri Life. Congratulations to Mark Rohr, his staff, and the people of Joplin who have worked hard to improve Joplin! For those who might have missed it, the Saturday edition of the Joplin Globe carried a brief history behind the construction of the Joplin High School building built at Eighth and Wall. The article covers the story from the school building’s initial planning, its architect, as well student efforts to raise support for the idea, and its eventual construction. At the end of the article, one can find a short note on the influence of the First World War and small pox. What Did You Do During the War, Grandma? During the height of World War One, a covert raid was launched by the Joplin Police Department on behalf of the federal government. Chief of Police Joseph H. Myers, Assistant Chief of Police Charles McManamy, Chief of Detectives William F. Gibson, and an assortment of “street sergeants” met under the cover of night at the police station. Few, if any, of their colleagues knew about the raid. Chief Myers was concerned some of his men might tip off the intended targets. At eleven o’clock at night, the men set out in squads. Their orders: to raid all rooming houses on Main Street and arrest all female occupants. 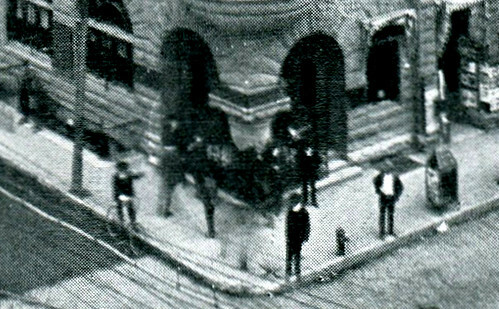 In a complete surprise, the chief and his men successfully carried off the raid. One hundred and forty two women were taken into custody and taken to the Joplin Police Department. Once there, they were examined by “city physicians under the direction of Dr. R.B. Tyler,” Joplin’s commissioner of health and sanitation. Those assisting Tyler were Drs. W.H. Lanyon, J.B. Williams, D. R. Hill, and R.W. Amos. Of that number, fifty five women were detained on suspicion of having a venereal disease. They were to be held for observation and would be released only after they showed no signs of a sexually transmitted disease. After the raid and subsequent examinations, Dr. Tyler told a reporter that “Joplin is unusually clean. Few of the girls detained will be required to remain in the detention home.” He estimated that at least ten percent of the women arrested were afflicted with venereal disease. Curiously, as the sun rose in the sky over Joplin, eight women voluntarily surrendered themselves at the police department for examination. Police Matron Wathena B. Hamilton and Assistant Matron Minnalin McKenna were to assist women find gainful employment if requested. 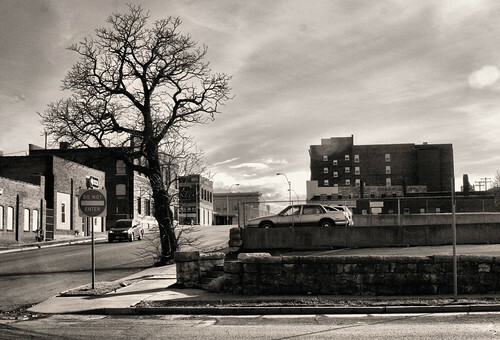 In anticipation of our coverage of the 1903 Joplin lynching, we bring you photographs of the location of the tragedy: Second and Wall. It was at this intersection that Thomas Gilyard was lynched from the arm of a telephone pole by a mob. 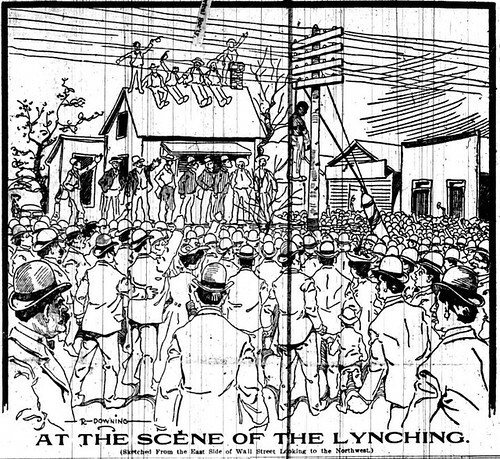 First is a drawing of the lynching that was printed in the Joplin Globe immediately after the lynching. The artist was Ralph Downing, who later went on to be an artist for the Kansas City Star (where he worked the rest of his career). 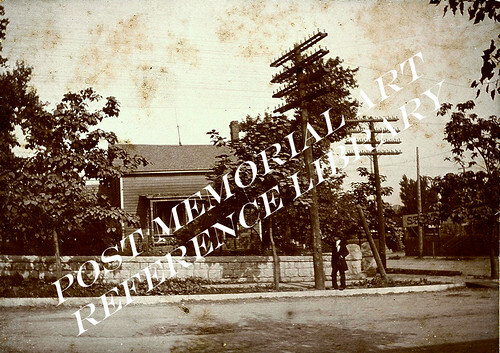 The first photograph comes courtesy of the Post Memorial Art Reference Library and was taken just a couple months after the lynching, if not sooner. The next photographs were taken just last month, December 2010. Regrettably, the time of day and the position of the sun got in the way of nailing a photograph from the exact same position. For identification purposes, the only surviving landmark from the gruesome moment is the stone retaining wall which you will find in all the images. If you don’t want to wait to learn more about the lynching, you can read about it in White Man’s Heaven by Kimberly Harper or pick up the most recent edition of the Missouri Historical Review. Sources: Post Memorial Art Reference Library, Joplin Daily Globe, White Man’s Heaven by Kimberly Harper, and Historic Joplin Collection. Why Isn’t the Missouri School of Mines in Joplin? When thinking of Joplin’s past as a part of the Tri-State Mining District, an area that covered thousands of acres, one might wonder why the Missouri School of Mines was not located in Joplin. 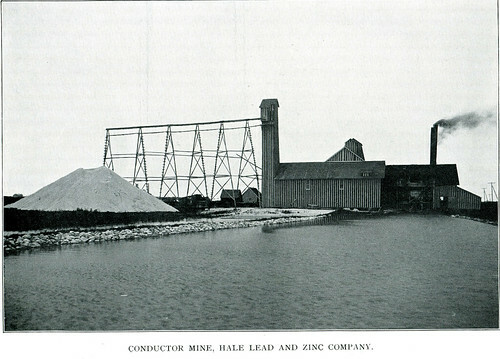 After all, the lead and zinc mining industry was a dominant industry for decades in the region, and notable advancements in mining were made in the area. The most obvious reason is because the Missouri School of Mines was founded in 1870. Joplin, founded in 1871, was not yet a muddy mining camp on the edge of Ozarks. The French began mining in what is now today eastern Missouri in the 1700s. The mining industry in eastern Missouri actually endured until the 1970s when mining giant St. Joe Mineral Corporation finally shut its doors. During the middle of the nineteenth century, there was an interest in establishing a school of mines and metallurgy. Rolla, on the edge of Missouri’s eastern mining region, was selected as the location of the new school. 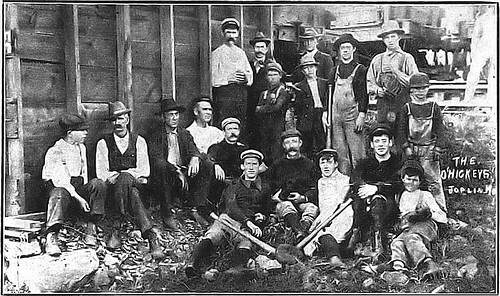 In 1870, the Missouri School of Mines and Metallurgy opened its doors to students. Joplin was established too late to be considered as a location for the Missouri School of Mines. In fact, it was not until 1937 that Joplin received its first college, when the Joplin Junior College was established (eventually to become Missouri Southern State University). One can only wonder what Joplin would be like today if it had received a state normal school like Springfield, its neighbor to the east, whose state normal school is now known as Missouri State University. Seven years after the successful lynching of Thomas Gilyard, a topic we will be giving considerable attention to in the near future, another lynching almost occurred in the neighboring community of Galena, Kansas, literally down the road from Joplin. 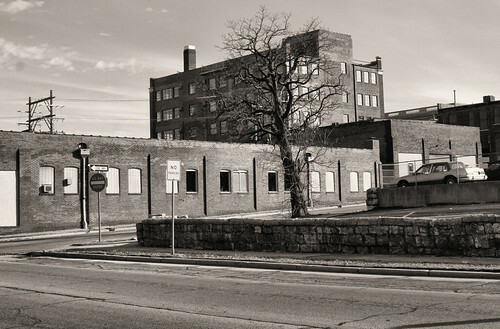 The would be victim of mob violence was an African-American resident, William Boston, or William Baldridge (as he was also sometimes called), had only recently been released from the state reformatory for cutting a street car conductor. As of 1910, Boston was just 21 years old, could not read or write, and may have even been listed as “deaf and dumb,” in the census. He was a Kansas native, but lived with his widowed grandmother, originally from South Carolina. The job William landed was at the Windle & Burr livery stable, and with it the coworker, Benjamin Jones, a foreman, born near Kansas City and approximately 51 years old. The alleged events thereafter followed. It came to Boston’s attention that Jones had a considerable amount of money upon him. The not quite reformed liveryman waited until night fall and for the foreman to fall asleep. To ensure a quick escape, he walked to another livery stable and telephoned for a carriage to wait him at the east side of town, his destination the depot of the Frisco Railroad. At that point, Boston returned to work and to the sleeping Jones. At this point, Jones had only hours to live, and of those hours, most of them spent dying at St. John’s Hospital. A piece of wood in hand, described as a scantling, Boston clubbed Jones in the head, smashing his skull. The killer took the money that Jones possessed and made for his escape. 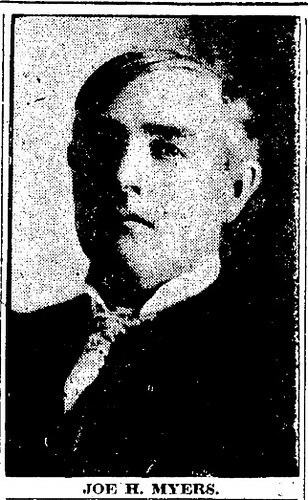 Not long after, the dying Jones was discovered by a coworker and the police alerted. It became a chase to catch the killer. How the Galena police discerned that Boston would make for the train depot is unsaid, but there they found him with a believed intent to catch an eastward headed train. At the point of three revolver barrels, Boston confessed to his identity in the early hours of the morning. He was quickly taken into custody to the city jail of Galena, where to initial dismay, only $6 was found on his person. The lack of the estimated sum taken from Jones was a mystery soon solved by the inquiry toward the “chewing tobacco” that Boston had in his mouth. Forced to disgorge it, the tobacco proved to be $70. To the Galena police, as well the natives of Galena, it seemed for certain that Boston was Jones’ attacker. This was cemented by a supposed confession by Boston, locked behind the bars, that he was the only man involved and did attack Jones. By sunrise, word has spread amongst the community of the attack and that the killer was in custody. Men, and later boys, began to gather around the jail. Hundreds, it was claimed, but by around 9 am, the number was said to be approximately 200. “Summary justice” for Boston was the subject of nearly every conversation, but, as a reporter noted, there seemed no leader ready to guide the mob into action. However, as time passed, the aggression of the mob began to rise. Galena police officers were “hooted and hissed,” as they began to repeatedly refuse to turn over the keys to the jail within which Boston sat. 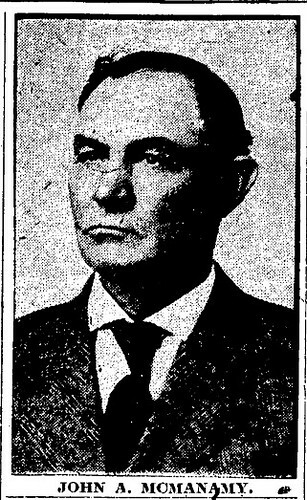 The Galena police chief, John Fitzgerald, the 44 year old son of Irish immigrants, grew alarmed as the intensity of the mob increased. The police chief vowed not to allow his prisoner to fall into the hands of the ever more bold crowd and quickly made two orders. First, he stationed a number of officers at the front of the city jail, and told them to act as if nervous about protecting the prisoner inside. Second, he requested a car brought to the rear of the jail. The plan worked. As the mob watched the distraction out front, Fitzgerald with a handcuffed Boston climbed into the motorcar and swiftly sped away to the county jail at Columbus. It was no time sooner, that a blood thirsty leader finally emerged and an organized the mob prepared to force their way into the jail, but only like a wave breaking upon the shore, to disperse upon the news that their prey had gotten away. 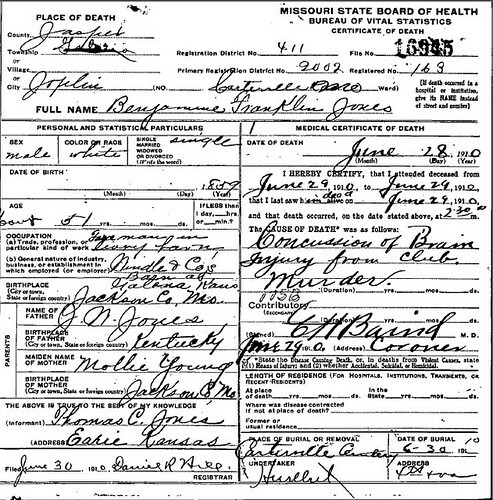 In a room at St. John’s hospital, Benjamin Jones, first generation American died of his wounds at approximately 2:30 pm on June 29, 1910. In Columbus, Kansas, William Boston quietly awaited to be tried. In Galena, Kansas, the Tri-State area narrowly avoided its next lynching following that in 1906 of Springfield, and the 1903 lynching in Joplin. Were it not for the quick thinking of its chief of Police, John Fitzgerald, the murderous legacy might have continued. For more on that legacy, either stay tuned in the near future for our posts on the 1903 Joplin lynching, or pick up a copy of White Man’s Heaven: The Lynching and Expulsion of Blacks in the Southern Ozarks, by Kimberly Harper. For those of you who have not yet had the chance to pick up the latest issue of the Joplin Metro Magazine, Historic Joplin was the focus of an interview. In addition, the magazine also featured a piece on what was going on a century ago in 1910 from the front page of the Joplin Globe. You can read the latest edition online here. This page took 0.240 seconds of computer labor to produce.